Irish Channel block party – 1:00 p.m. starts on Magazine & Felicity at 1:00p.m. The parade follows Noon Mass at St. Mary’s Assumption Church and is returning to a previous route following the completion of road construction on Louisiana Ave. The parade marches from Magazine St. to Jackson Ave., to St. Charles Ave., to Louisiana Ave., to Magazine St., and ending after turning river-bound on Jackson Ave.
Molly’s at the Market Irish Parade – 6:00 p.m.
Jim Monaghan’s parade rolls Friday (March 11) at 6:30 p.m. The parade takes its leave from Molly’s at the Market (1107 Decatur. St.), then the route will lead marchers down Decatur Street to take a right on Bienville Street, then take a right on Dauphine Street to loop past Erin Rose (811 Conti St.). They’ll march down Bourbon then finally take a right on Gov. Nicholls St. to return to Molly’s. Parasol’s Block Party 10 a.m. – 8 p.m.
3rd and Constance 10am to 8pm. Music, green beer, food and surprises. The start of the block parties on the day of the Irish Channel Parade. Irish Channel Parade – 1:00 p.m. The parade follows Noon Mass at St. Mary’s Assumption Church, and marches from Magazine St. to Jackson Ave., to St. Charles Ave., to Louisiana Ave., to Magazine St., and ending after turning river-bound on Jackson Ave. The floats and Maids will start the parade at Canal Street and Charters at 6:00 p.m; the marchers will then follow. The only difference between the route for the floats and Maids and the route for the marchers is that when the floats and Maids turn onto St. Ann, they will proceed to Decatur Street and back to the Hilton Hotel instead of turning onto Royal Street like the marchers. The Louisiana Irish-Italian Parade will roll at 12:00 noon, onVeterans Highway in Metairie. The parade starts at 12noon along the W. Judge Perez route in Chalmette. It consists of 53+ floats, 35+marching groups 1,500+ members and 350,000 pounds of produce. In light of the city’s Tricentenniel, ​Bulbancha: Decolonized Walk of New Orleans ​seeks to recenter the founding narrative of New Orleans on the area’s original inhabitants. We will explore the rich pre-colonial history of “New Orleans” by retracing the footsteps of the many indigenous groups who flourished here before the arrival of Europeans, back when this land was called “Bulbancha”. We will walk along the city’s pre-colonial roads to visit the some of the locations of the earliest native markets and settlements. The walk will also highlight the vital role that indigenous peoples played in the founding and development of New Orleans as a city. We will hear stories of native resistance to colonization and confront the myth of European dominance in the region. Participants will be encouraged to adopt a decolonized lens, in order to better understand New Orleans and many aspects of its unique Creole culture as undeniable products of indigenous culture. All walks will begin at the Bienville Monument located between Conti, Decatur and N. Peters streets and will end at Congo Square. We will begin on time and participants should allow for approximately two hours. Sliding scale $10-$20 (no one turned away for lack of funds). Please call (504) 656-6306 to reserve your spot. Walk-ups will be accepted if spots are available. Private walks available by appointment. All walks are led by local indigenous folks who descend from the tribes discussed on the walk. My neighbor Frank wrote this piece which describes a little of the 1970s LGBTQ activism in the Quarter in response to the 1970s Sarah Palin, the horrid Anita Bryant. As someone who moved into and then grew up in the lower Quarter as a teen, I always felt welcomed by the gay community that was active around St. Phillip. My best friend Roger Simonson who had come out as a young man and had lived in the Quarter since the 1960s was known for his Royal street shop A Better Mousetrap and his later management of Roger Bogle’s Persian Boy gallery. Through his friendship, I was included in many parties and allowed in bars and clubs that did not encourage non-gay attendance back then. The leaders of the gay community have tirelessly worked alongside the old-line preservationists on many community efforts that impact the Quarter. That dual leadership served the neighborhood well as it meant the issues of one group were not the only ones being met any longer and it allowed younger and less wealthy voices to be heard on political matters. Since the 1990s, many in the community moved to other areas of town, expanding the impact of that early Quarter activism into every part of municipal and social life. With the acceptance by most Americans (especially younger ones) of less strict gender and sexuality definitions or mores, the need for gay-only areas, clubs, and events has lessened. As exciting as it is to live in a time when sexuality is not so closely monitored by a few disapproving Puritans, it is sad to lose the active presence here of some of those wonderful leaders even while I remain grateful to Frank and others for continuing to offer so much civic energy. LOVE her work and cannot wait for the book. As long as we’re on this story again, I am always surprised by how many freethinkers still trot out the erroneous story of how the win to not build the Riverfront spur in the Quarter in the 1960s led to the Claiborne Expressway. Simply not true. 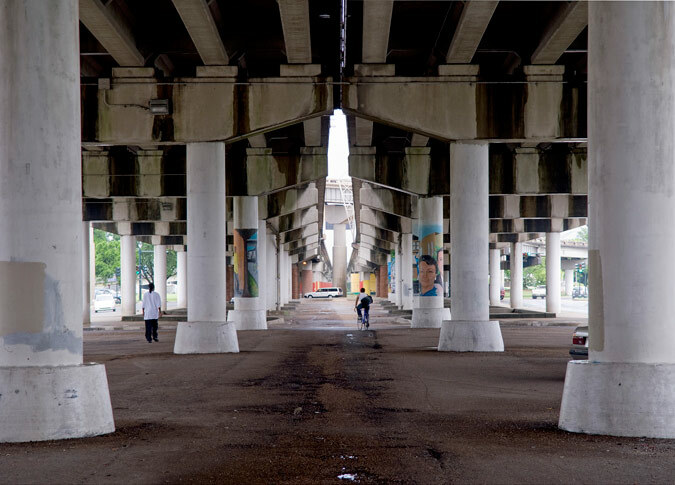 In any case, it’s time to focus on the positive benefits of taking down the Claiborne Expressway and make sure that more negative developments are not put in its place.